Originally published on July 13 under the title "Once Again, Al-Qaeda Brands Itself as Social Justice Warriors." 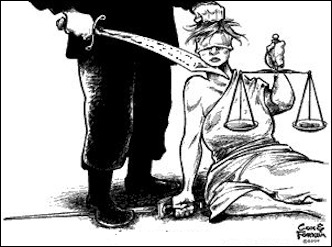 The "social justice" Al-Qaeda has in store for the world's aggrieved would be a mixed bag. After the Orlando massacre, when an armed Muslim murdered 49 people in a gay nightclub, al-Qaeda published a guide urging more such "lone wolf" attacks – with the added caveat that jihadists should exclusively target mainstream white Americans. According to the jihadi group's online publication "Inspire guide: Orlando operation," killing homosexuals is "the most binding duty." However, would-be jihadis are advised to "avoid targeting places and crowds where minorities are generally found in America," and instead to target "areas where the Anglo-Saxon community is generally concentrated." In response, several pundits warned that al-Qaeda is shifting gears, somehow trying to portray itself as a "social justice warrior." In fact, al-Qaeda has long presented itself to the West in this manner. Al-Qaeda has long presented itself as seeking social justice for Western minorities. These latest instructions are hardly new. Further, they help explain the real differences between al-Qaeda and ISIS, and which stage of jihad they see themselves in. Although The Al Qaeda Reader documents al-Qaeda's dual approach -- preach unrelenting jihad to Muslims, whine about grievances to Westerners -- a nearly decade-old communique from al-Qaeda leader Ayman al-Zawahiri is sufficient to understand the strategy behind these latest instructions. That's why I want blacks in America, people of color, American Indians, Hispanics, and all the weak and oppressed in North and South America, in Africa and Asia, and all over the world, to know that when we wage jihad in Allah's path, we aren't waging jihad to lift oppression from Muslims only; we are waging jihad to lift oppression from all mankind, because Allah has ordered us never to accept oppression, whatever it may be ... This is why I want every oppressed one on the face of the earth to know that our victory over America and the Crusading West -- with Allah's permission -- is a victory for them, because they shall be freed from the most powerful tyrannical force in the history of mankind. American blacks, however, were Zawahiri's primary targets. Zawahiri praised and quoted from the convert to Islam, Malcolm X: "Anytime you beg another man to set you free, you will never be free. Freedom is something you have to do for yourself. The price of freedom is death." 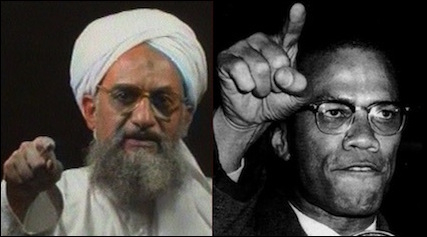 Al-Qaeda leader Ayman al-Zawahiri (left) is fond of quoting Malcolm X. The al-Qaeda leader also appealed to another potentially sympathetic population -- environmentalists: "[The U.S.] went out and ruined for the entire world, the atmosphere and climate with the gases emitted by its factories." Years earlier, Osama bin Laden himself complained about the U.S. not signing the Kyoto protocols: "You [the U.S.] have destroyed nature with your industrial waste and gases more than any other nation in history." What does this ostensibly disparate group of people -- "third-worlders," environmentalists, and disaffected American blacks -- have in common? They all harbor anti-Western sentiments that can be appealed to for purposes of exonerating al-Qaeda's jihad. Now, al-Qaeda is again reaffirming that killing homosexuals is "the most binding duty," but it's still best to continue targeting non-minorities in America -- "Anglo-Saxons" -- because they are so easy to demonize. Zawahiri used the same strategy in Egypt in 2014. During a particularly brutal period of Christian persecution -- dozens of churches were burned -- he counseled Egypt's Muslims to stop attacking Coptic Christians. The al-Qaeda leader, who on numerous occasions had exhibited his antipathy for Christians, made clear that his directive was purely for PR purposes; he was concerned about jihad's image in the West. While agreeing to the most draconian of Sharia's tenets, al-Qaeda also knows that many of these -- for example, the destruction of churches and subjugation of "infidel" Christians -- need to be curtailed or hidden from the Western world. Otherwise, al-Qaeda's efforts of portraying jihadis as "freedom fighters" resisting an oppressive West risk being undermined. Unlike al-Qaeda, ISIS is indifferent to Western opinion. On the other hand, ISIS represents the unapologetic jihad, indifferent to Western opinion. By widely broadcasting its savage triumphalism in the name of Islam, ISIS forfeits the "social warrior" card and instead plays the "strength" card. In this manner ISIS has inspired hundreds of millions of Muslims, according to some disturbing polls. Al-Qaeda was born at a time when deceiving the West about the aims of the jihad was deemed necessary; ISIS was born at a time when deceiving an already passive West is no longer deemed important. Time will tell which strategy works better.